Download "Lawrence S. Farey. 193 S.W. Seminole Drive Aloha, OR 97006"
2 TRW/TED Accelerometer vvafer Process Production Facilit.v 1047 complex systems with nonlinear product flows and operator interface with machines. They can account for uncertainty by handling product rework, machine breakdowns, and variable process times. Organizations must be able to react quickly to changes from the market place, changes in technology, and changes on the factory floor. 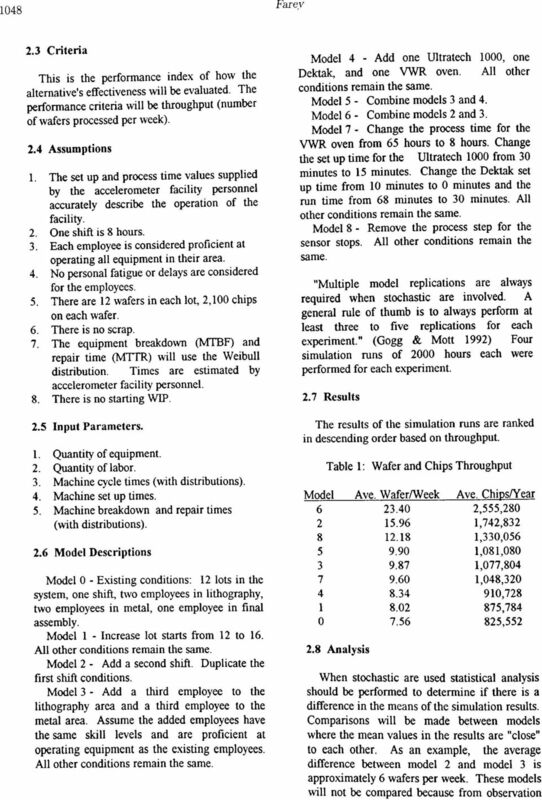 Using a validated simulation model, developed with the proper software, a company can make decisions on the computer before implementing them on the factory floor. This is a very cost effective way ofdetermining a course ofaction. 1.2 Simulation Software There are numerous simulation software packages currently available. In choosing a package the user should look for three characteristics: speed, flexibility and animation. Taylor II software was chosen because it excels in all three characteristics. Speed: Taylor II uses an optimized simulation algorithm that guarantees fast simulation runs. Simulations can be run for a fixed time or until a certain condition is reached. Flexibility: Taylor II is a menu driven package that allows the user to graphically build models by positioning resources like machines, buffers, conveyors, reservoirs, warehouses, transports and labor on the screen. Details are added to the model by using pre defined parameters, distributions and Taylor interface language. Information on model runs is collected through several pre defined reports or through user created reports. Animation: Animation servers two purposes: model verification (does the model behave as intended?) and presentation of the model and results. Because the animation is integrated into Taylor II and can be used instantly, it will verify (or refute) the model immediately. Taylor II's combination of these three characteristics gives the experienced simulation user the flexibility and performance to model the most complex systems and present the results in a timely manner with as much detail as the project requires. 2 ACCELEROMETER FACILITY MODEL 2.1 Problem Definition The production of the air bag sensors (semi conductor chips) developed by the accelerometer facility has been a success. Requests for the sensor by the automotive industry is increasing. To detennine if these requests can be met, the maximum capacity of the facility must be established. There area four methods of maximizing the capacity of the existing facility: add employees, add process equipment, add employees and process equipment, and change or eliminate process steps. Changing the physical layout will not be considered since the original layout was developed taking into consideration process flow, cleanliness requirements, and air flo\v dynamics ofthe clean rooms. Adding employees is restricted floor space in the clean rooms, the skill level required to operate the equipment, and machine cycle times. The machine cycle times prevent an employee from being assigned to only one machine or work station. Equipment should be added at the bottleneck points. These points were determined through interviews with the accelerometer personnel and by observation. The bottlenecks occur at the Ultratech 1000 and the Dektak in lithography and the VWR ovens in metals. Through experiments being conducted the accelerometer personnel feel the process can be changed as follows: the process time for the VWR oven can be reduced, the process time for the Dektak can be reduced, and the process steps for the sensor stops can be eliminated. With more experience and training the set up times for the Ultratech 1000 and the Dektak can be reduced. 2.2 Simulation Goal Determine the maximum output of accelerometer parts (chips) from the TED Accelerometer Wafer Processing Facility at Space Park in Redondo Beach. 6 TRWITED Accelerometer Wafer Process Production Facility 1051 collected from the Irwindale facility and added to the current manufacturing simulation. 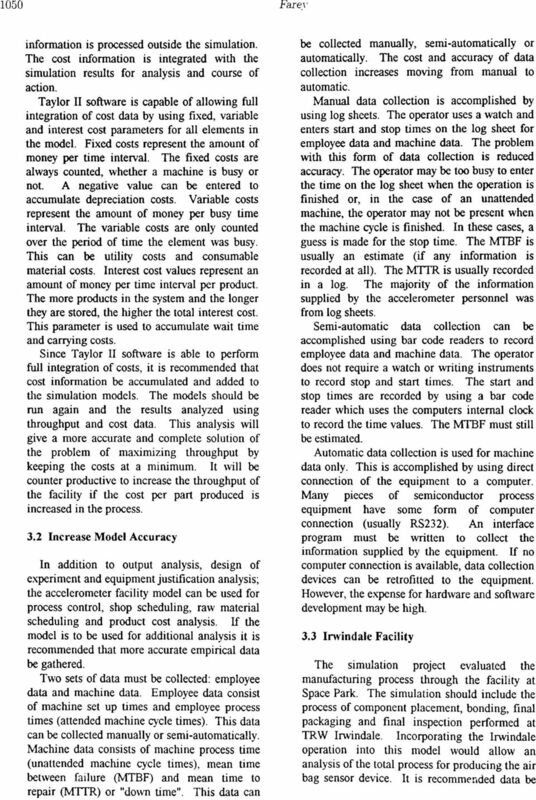 4 UPDATE The model and original report were completed in the third quarter of The model is currently being used to make production related decisions as described in the first paragraph ofsection 3.2. A bar code data gathering system and automatic data collection from process equipment have been implemented. The accelerometer management have indicated they will continue to modify and update the model as conditions change in the facility. The model will be used as a tool to help make production related decisions. 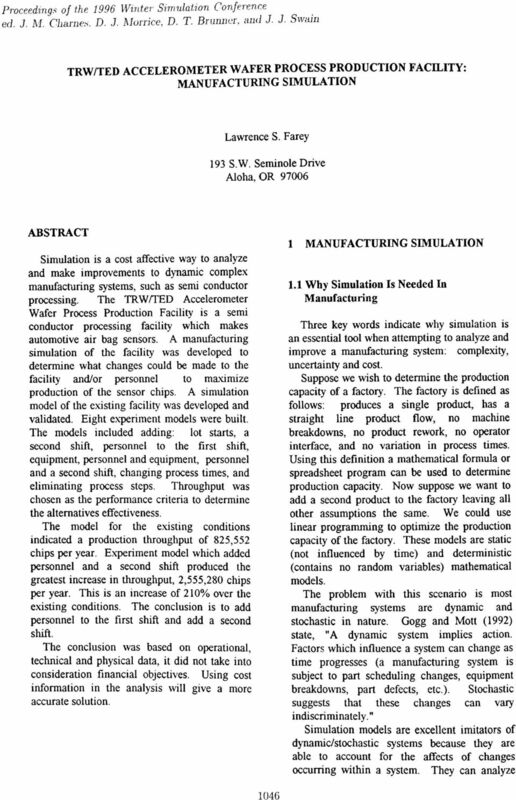 REFERENCES Gogg, Thomas J. and Jack R.A. Mott Improve Quality and Productivity with Simulation. Library of Congress Catalog Card Number: ISBN AUTHOR BIOGRAPHY LAWRENCE S. FAREY is a Senior Facility Engineer for Fujitsu Computer Products of America and principle of LSF Consulting. He received a B.S. degree in Industrial Engineering from Oregon State University in 1987 and he received a Masters degree in Business Administration from California State University, Fullerton in He is a licensed Engineer in the State of California and a Certified Plant Engineer. He is a member of the National Society of Professional Engineers, the Association for Facilities Engineering, and the Institute ofindustrial Engineers. Prnceedings of the 1996 WinteT Simulation ConfeTence ed. J. M. ClIarnes, D. J. Morrice, D. T. Brunner, and J. J. 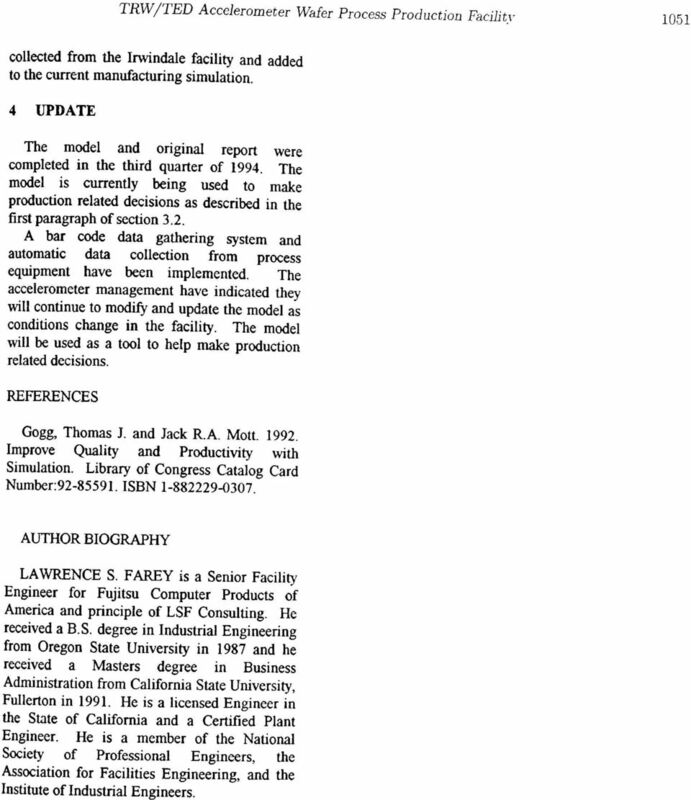 8lvain TAYLOR II MANUFACTURING SIMULATION SOFTWARE Cliff B. King F&H Simulations, Inc. P.O. 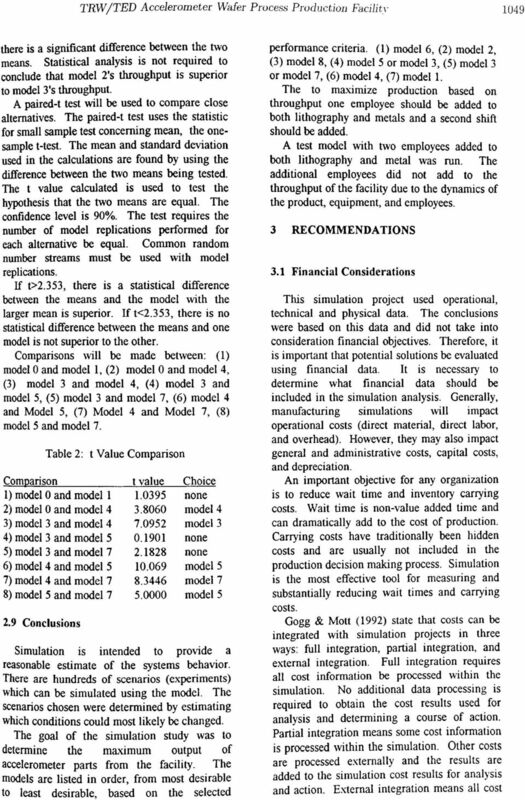 A Comparison of System Dynamics (SD) and Discrete Event Simulation (DES) Al Sweetser Overview. TestScape. On-line, test data management and root cause analysis system. On-line Visibility. Ease of Use. Modular and Scalable. Traceability Data Integrity: Challenges and Solutions By Mitch DeCaire, Cogiscan, Inc.
white paper Inventory Control: Control it before it controls you Introduction The purpose of this paper is to offer up ideas and discussion points on the importance of inventory control for businesses. Rules to Consider. All work shall be highly specified as to content, timing, sequence, and outcome. This can be done by simply counting pieces in the line or subtracting total number of pieces loaded to total number of pieces unloaded from the line. Lean Course Objectives: Your Employees will be able to: Louisiana Tech University Lean Manufacturing Courses Understand the tools, terms, terminology, and most importantly the benefits of Lean Manufacturing. In this chapter, you will learn improvement curve concepts and their application to cost and price analysis. BSCM Sample TEST. 1. Which of the following demand fulfillment approaches typically provides the longest delivery time? A) Engineer-to-order. B) Make-to-order. C) Assemble-to-order. D) Make-to-stock. 2.